American Field Guide - This PBS site collected over 1200 video clips to enable you to experience America's wilderness: animals, ecosystems, human history, livlihoods, earth and space, plants (flowers, grasses, non-native species, shrubs, trees), public policy, and recreation. American Journal of Botany - Internationally recognized journal accepting refereed research papers on all aspects of plant biology. American Society of Plant Biologists (ASPB) - Founded in 1924 to promote the growth and development of plant physiology, to encourage and publish research in plant physiology, and to promote the interests and growth of plant scientists in general. Over the decades the Society has evolved and expanded to provide a forum for molecular and cellular biology as well as to serve the basic interests of plant science. It publishes the highly cited and respected journals Plant Physiology and The Plant Cell. Annals of Botany - Provides a forum for discussions relating to The Annals of Botany and AoB PLANT, peer-reviewed journals are published by Oxford University Press. Archaeobotanical Database of Eastern Mediterranean and Near Eastern Sites - Part of a research project that investigates the development of prehistoric wild plant floras of the Near East and the Eastern Mediterranean. The geographic area represented in the data, includes Greece, Turkey, Western Iran, Iraq, Syria, Lebanon, Israel, Jordan, and Northern Egypt. The chronological frame comprises the Chalcolithic period, Bronze and Iron Ages, up to Medieval periods. ARKive - Centralised digital library of films, photographs and associated recordings of species. A leading virtual conservation effort - finding, sorting, cataloguing and copying the key records of species, and building them into a comprehensive and enduring audio-visual record. BBC Gardening - Gardening news, features and advice from BBC experts (Toby Buckland, Chris Beardshaw, Joe Swift, Carol Klein). TV and radio program information and catch up, plant search, pest and disease identifier, gardeners' calendar, design guides and ethical gardening tips. BIFLORA - A scientific database with information about the highly endangered plant species of the island of Hainan, People's Republic of China. Biodiversity Heritage Library (BHL) - A consortium of natural history and botanical libraries that cooperate to digitize and make accessible the legacy literature of biodiversity held in their collections and to make that literature available for open access and responsible use as a part of a global biodiversity commons. BHL also serves as the foundational literature component of the Encyclopedia of Life (EOL). Botanical Society of America - Promotes research and teaching in all fields of plant biology. Botany Online: The Internet Hypertextbook - Classification and nomenclature, botanical databases and online journals, organizations and other biology and botanical resources. Boyce Thompson Institute (BTI) - Working to reveal the natural processes that underlie plant life, BTI investigates how plants grow and develop, how they ward-off insects and disease, how they produce nutrients in food and how they interact with the environment. Calflora - Provides access to information about all 8,375 currently recognized vascular plants in California, including over 800,000 records of plant observations and 20,000 photographs. California Garden Clubs, Inc. - Online home of more than 20,000 California garden club members. Affiliated with the National Garden Clubs, Inc.
CalPhotos - A collection of 46,466 images of plants, animals, fossils, people, and landscapes. Centre for Iinternational Ethnomedicinal Education and Research - Focal point for ethnomedicinal knowledge and an international network of ethnobotanical researchers. Complete Work of Charles Darwin Online - This website contains over 99,000 pages of searchable text and 213,000 electronic images, at least one exemplar of all known Darwin publications, reproduced to the highest scholarly standards, both as searchable text and electronic images of the originals. The majority of these have been edited and annotated here for the first time with thousands of original editorial notes. Conservatory of Flowers - San Francisco, California. Opened in 1879, the wood and glass greenhouse is the oldest existing conservatory in the Western Hemisphere and has attracted millions of visitors to Golden Gate Park since it first opened its doors. Immersive displays in five galleries include the lowland tropics, highland tropics, aquatic plants, potted plants and special exhibits. The Conservatory is one of only four public institutions in the United States to house a highland tropics exhibit. The Conservatory of Flowers is a spectacular living museum of rare and beautiful tropical plants under glass. From Borneo to Bolivia, the 1500 species of plants at the Conservatory represent unusual flora from more than 50 countries around the world. It houses an increasingly important collection of endangered plant species, including ferns, palms and aroids. It is also home to an unparalleled collection of high-altitude orchids -- more than 700 of the 1,000 known species. It is the largest and most comprehensive public collection in the world. 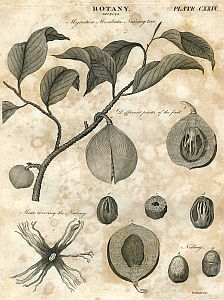 Curtis Botanical Magazine - Images taken from The Curtis Botanical Magazine, which William Curtis began publishing in 1787. This digital presentation represents 1018 images, their information records and 2441 related title pages from the first 26 volumes. The entire print collection of 164 volumes is housed at the National Agricultural Library in Beltsville, Maryland. Danforth Plant Science Center - Researching how plants grow and develop, how they resist disease and drought, heat and cold, and what adaptations must be made to decrease the need for chemical fertilizers and pesticides. Desert Plants & Wildflowers - Information on desert plants and wildflowers, wildflower reports, wildflower field guide. Electronic Plant Information Centre (ePIC) - Plant information from the Royal Botanic Gardens, Kew including plant names, bibliographies, species and specimen data. eNature - A searchable database for identifying more than 4,000 plant and animal species of North America. The species accounts are from the best-selling National Audubon Society Field Guides, Regional Guides, and Nature Guides. Endeavour Botanical Illustrations - The voyage of HMS Endeavour (1768-1771) was the first devoted exclusively to scientific discovery. This site presents most of the botanical drawings and engravings prepared by artist Sydney Parkinson before his untimely death at sea, and by other artists back in England working from Parkinson's initial sketches. Ethnobotanical Resource Directory - Global information regarding ethnobotanical research and documentation. Ferns: Past and Present - NSF-funded collaborative research study by the Field Museum of Natural History University of California at Berkeley and Utah State University. Forensic Botany - Ann overview of the developing field of forensic botany, the application of plant science to the resolution of legal questions. ForestryImages - Quality photographs of forest insects and disease organisms. Fungi Perfecti - A family-owned, environmentally friendly company specializing in using gourmet and medicinal mushrooms to improve the health of the planet and its people. Leaders in a new wave of technologies harnessing the inherent power of mushrooms and fungal mycelium worldwide. Gardening Launch Pad - Gardening links portal. Gardens Links - Listing of the best gardening sites. GardenWeb - The largest gardening site on the web, with garden forums, articles on gardening, directories of nurseries, gardens and gardening organizations, a botanical glossary, an events calendar, a plant database, contests, and more. Guide to Poisonous Plants - Locate a plant by its common or botanical name. Homes and Gardens - Britain's best-known glossy interiors magazine, featuring beautiful houses and gardens, inspiring decorating ideas, interior styles, designers and decorators, unusual shops and the latest buys for your home and garden. International Plant Science Center - Seeks to discover and document Earth's biodiversity in order to understand and preserve its irreplaceable resources. Internet Directory for Botany - Index to botanical information available on the Internet. INVADERS Database - A comprehensive database of exotic plant names and weed distribution records for five states in the northwestern U.S.
Kew Library - The Kew Library Catalogues form a gateway to one of the largest resources of botanical information in the world. They record the bibliographic details of material held in the Main Library of the Royal Botanic Gardens, Kew, and across all branch libraries at Kew and Wakehurst Place. Leading Botany, Plant Biology and Science Journals - Sites usually have a Tables of Contents and frequently have selected articles. Mediterranean Garden Society - An international forum devoted to furthering knowledge and appreciation of plants and gardens suited to the mediterranean climate regions of the world. Missouri Botanical Garden - Founded in 1859, the Missouri Botanical Garden is the oldest botanical garden in continuous operation in the U.S. and a National Historic Landmark. Missouri Botanical Garden Botanicus Digital Library - A freely accessible portal to historic botanical literature. Missouri Botanical Garden Library - Founded in 1859 by Henry Shaw, the library is an essential part of the Garden's research program. It is used in conjunction with the herbarium by Garden research staff, botany students, and visiting scientists from around the world. Horticulturists, landscape designers, historians, biographers, and Garden members also use the library. Missouri Botanical Garden Library: Rare Books - Features 46 digitized volumes from our Rare Book collection. View 16,133 pages and 2,050 botanical illustrations online. The Plant List - The Plant List includes 1.25 million scientific plant names, of which 1.04 million are names of species rank. Of the species names included in The Plant List, about 300,000 (29 percent) are accepted names for species and about 480,000 (46 percent) are recorded as synonyms of those species. The status of the remaining 260,000 names is "unresolved" since the contributing data sets do not contain sufficient evidence to decide whether they should be accepted names or synonyms. The Plant List includes a further 204,000 scientific plant names of infraspecific taxonomic rank linked to those species names. Monticello: The Vegetable Garden - History of the vegetable gardens at the Monticello home of 3rd U.S. president Thomas Jefferson, who "grew 250 varieties of more than 70 different species of vegetables, precisely recording the details of their growth." Includes photos, a map showing the location of the vegetable garden terrace, and information about the restoration of the gardens. From the Thomas Jefferson Foundation. Montreal Botanical Garden - With its collection of 22,000 plant species and cultivars, 10 exhibition greenhouses, some thirty thematic gardens, and teams of researchers and activities staff, the Montreal Botanical Garden ranks as one of the world's largest and most spectacular botanical gardens. Mycological Society of America (MSA) - A scientific society dedicated to advancing the science of mycology - the study of fungi of all kinds including mushrooms, molds, truffles, yeasts, lichens, plant pathogens, and medically important fungi. MSA's scholarly journal Mycologia is one of the top mycological serials worldwide. Its bimonthly newsletter Inoculum keeps members up to date on fungal news of all kinds. N.I. Vavilov Research Institute of Plant Industry (VIR) - Plant genetics resources (PGR) collection, conservation and study. The Institute maintains a global PGR collection encompassing 320,000 accessions of 155 botanical families, 2,532 species of 425 genera. The collection harbours 95,000 accessions of grain crops, over 43,000 of legumes, 52,000 of groat crops, 26,000 of industrial crops, 28,000 of fodder crops, about 10,000 of potato, and 50,000 of vegetables. VIR also maintains a herbarium of 260,000 specimens. National Garden CLubs - Provides education, resources and national networking opportunities for its members to promote the love of gardening, floral design, civic and environmental responsibility. NatureServe - A source for authoritative conservation information on more than 50,000 plants, animals, and ecological communities of the U.S. and Canada. New York Botanical Gardens - 48 specialty garden and plant collections, a 40-acre forest, and the largest Victorian conservatory in the U.S.
Oak Spring Garden Library: Rare Books - Rachel Lambert Mellon's celebrated collection of rare books, manuscripts, works of art and related artifacts concerning gardens, gardening, landscape design, horticulture, and botany. Conserved at Upperville, Virginia, in a striking library designed by Edward Larrabee Barnes in consultation with Rachel Mellon and a new wing designed by Thomas M. Beach in consultation with Rachel Mellon, the collection is both a unique historical archive and a day-to-day working resource. Open Tree of Life - Working to construct a comprehensive, dynamic and digitally-available tree of life by synthesizing published phylogenetic trees along with taxonomic data. The project is a collaborative effort between 11 PIs across 10 institutions. Funding is from NSF AVAToL #1208809. Also see Tree of Life Web Project for further information. Plant Finder - Database provided by BBC. Look up detailed information about thousands of plants using our searchable database. Find descriptions of the plants and tips about growing them. Plant Image Gallery - Contains about 2,000 pictures of plants native to several parts of the world, including Europe, Costa Rica and Galapagos Islands. Plant Physiology - An international journal devoted to physiology, biochemistry, cellular and molecular biology, genetics, biophysics, and environmental biology of plants. Plant Physiology is one of the world's oldest and most well-respected plant science journals. A publication of the American Society of Plant Physiologists (ASPP). PlantCare - A database of over 2,000 species of house and greenhouse plants providing 18 categories of care, from watering to lighting. Plants Map - Hosts botanical collections with customized tools that solve the challenges of documenting, organizing, mapping, tagging and sharing information about plants. Plants of Hawaii - A collection of images, maps, and reports of plants of Hawaii. PLANTSTRESS - This site is a brokerage of information, a meeting place, a consultation facility, and a source for professional update on issues of plant environmental stress. Poisonous Plants Informational Database (Cornell University) - This is a growing reference that includes plant images, pictures of affected animals and presentations concerning the botany, chemistry, toxicology, diagnosis and prevention of poisoning of animals by plants and other natural flora (fungi, etc.). Postcode Plants Database, The - Generates lists of native plants and wildlife for any specified postal district in the United Kingdom. Robinson Loves Plants - Amelia Robinson blogging on plants and gardens. Royal Botanic Gardens, Kew - The latest information on seasonal features and events to enjoy at the RBG, Kew, UK. Information on biodiversity, paleobotany, progagation and orchids. Royal Horticultural Society (UK) - The world's leading horticultural organization with science and educational departments based at RHS Garden, Wisley. Seed Savers - Working to conserve and promote America's culturally diverse but endangered garden and food crop heritage for future generations by collecting, growing, and sharing heirloom seeds and plants. Seeds of Freedom - Charts the story of seed from its roots at the heart of traditional, diversity-rich farming systems across the world, to being transformed into a powerful commodity, used to monopolise the global food system. The film highlights the extent to which the industrial agricultural system, and genetically modified (GM) seeds in particular, has impacted on the enormous agro-biodiversity evolved by farmers and communities around the world, since the beginning of agriculture. Seeds of Freedom seeks to challenge the mantra, promoted by the pro-GM lobby, that large-scale, industrial agriculture is the only means by which we can feed the world. In tracking the story of seed it becomes clear how the corporate agenda has driven the take over of seed in order to make vast profit and control of the global food system. Svalbard Global Seed Vault - Way up north, in the permafrost, 1300 kilometers beyond the Arctic Circle, is the world's largest secure seed storage, opened by the Norwegian Government in February 2008. From all across the globe, crates of seeds are sent here for safe and secure long-term storage in cold and dry rock vaults. SEPASAL - A database and enquiry service about useful "wild" and semi-domesticated plants of tropical and subtropical drylands, developed and maintained at the Royal Botanic Gardens, Kew. Smithsonian Catalog of Botanical Illustrations - A database of the more than 3000 botanical illustrations curated by the department's scientific illustrator, Alice Tangerini. Society of American Florists - National trade association that provides marketing, government advocacy, industry intelligence and best practices information for all participants in the U.S. floral industry. Species 2000 - Species 2000 has the objective of enumerating all known species of plants, animals, fungi and microbes on Earth as the baseline dataset for studies of global biodiversity. Ultimate Compost Guide - All about composting, from Amelia Robinson. United States Botanic Gardens - A living plant museum. Exhibits interpret the role of plants in supporting earth's diverse and fragile ecosystems and in enriching human life. Public displays are located in the Conservatory, on the surrounding terrace gardens, and in adjacent Bartholdi Park. The U.S. Botanic Garden Conservatory is located on the Capitol Grounds at the intersection of Maryland Avenue and First Street, S.W., in Washington, D.C. Established by Congress in 1820, the U.S. Botanic Garden is one of the oldest botanic gardens in North America. Vascular Plant Image Gallery - Over 8800 plant images. Virtual Plant and Pest Diagnostic Laboratory (PDL) - Provides rapid and accurate identification of pests and problems associated with plants as well as other types of vertebrate and invertebrate pests. What is Photosynthesis? - Links to articles that discuss photosynthesis at varying degrees of complexity. This webpage last updated on Sunday, July 9, 2017 2:49 PM.